Looking for the latest bike and dirt bike games? 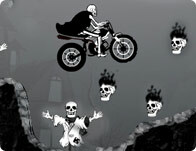 Play online our new and exclusive game called Stunt Rat Underground here on SuperGames. You will enter the creepy zone as you reached the goodies cellar! Your job is to get to the end of the game and capture the cheese stash that is waiting for you and your biker clan. Use space to jump over obstacles and make it to the finish line in one piece. If you have pro skills you will be able to unlock some other cool dirt bikes after each 3 levels. Along the way you will have to ride on copper pipes and pass over many obstacles like: cockroaches, spider web, matches and all kind of household supplies. Also enjoy nice and friendly looking graphics. Make sure to pass all the levels to get the biggest cheese stash in the world. Help the Stunt Rat capture the cheese and make the biker clan proud. Good luck and have fun with Stunt Rat Underground! Use arrow keys to drive and balance your dirt bike and space bar to jump. Grab a bike and head out into the snow, race as fast as you can beating levels, and unlocking new bikes. Get on your motorbike and race around the track versus three other high class racers. Watch out for oil slicks and hit the speed tracks for an extra boost!